Physically disabled people find it hard to fully integrate into the society. Faced with numerous challenges, they are left with limited opportunities. Many times, they miss out on quality education due to this alienation. To support such specially-abled students, the government provides a number of scholarships. One can easily find these physically challenged scholarships on government websites and portals but in most cases, the scholarship seekers are unaware of these scholarships. So here in this article, I’ve discussed few of the major physically challenged scholarships that can benefit these specially-abled students. In a world that is obsessed with how a man looks, the physically challenged are already at a disadvantage. Besides dealing with their disabilities, they also need to deal with the prejudice and discrimination that comes their way. A lack of opportunities (like reservations, entrance relaxation, physically challenged scholarships), in education and employment only adds to their misery. On a day to day basis, they deal with numerous challenges; be that the stares, the ridicule, the patronizing attitude of the general public or an outright hostility. Also, the inconvenience while travelling, a lack of social life and unavailability of proper infrastructure to support the special needs of physically challenged only adds to their woes. As a society, we fail to appreciate them for their abilities and often judge them for their disabilities. In doing so, we are holding them back from fulfilling their potential. As Chris Burke has rightly said, “It’s not our disabilities, it’s our abilities that count”. Stephen Hawking was a testament to that, a role model for all such people. In his own words, “My advice to other disabled people would be, concentrate on things your disability doesn’t prevent you doing well and don’t regret the things it interferes with. Don’t be disabled in spirit as well as physically”. So, don’t be bound by the limits. Instead, let there be no limits. Check out these scholarships for the physically challenged students. Department of Social Justice and Empowerment, Government of Gujarat is offering this scholarship for physically-handicapped school students. It provides financial assistance to students from economically weaker sections in order to support their education. The selected applicants can earn up to INR 5000 per annum under this program. However, only the domiciles of Gujrat are eligible for this psychically challenged scholarship scheme. Physically disabled students who are domiciles of Maharashtra and are between the age of 6 and 18 years and above are eligible to apply for this scholarship. Visually impaired, orthopedically handicapped and hearing-impaired students are eligible to apply for this scholarship. Students selected under this program will receive financial support for education as well as vocational training and free facilities. This scholarship provided by AICTE supports differently-abled students hailing from economically weaker sections. Under this program, a total of 1000 students receive financial assistance to pursue technical education. The applicants must be a student of graduation course under AICTE to be eligible for this scholarship. The selected students get up to INR 30000 for tuition fee and contingency up to INR 2000 per month. Also, students from any part of the country can apply for this program. The Ability Foundation and CavinKare Pvt Ltd. jointly present the CavinKare Ability Awards. There are two categories of these awards: CavinKare Ability Mastery Awards and CavinKare Ability Award for Eminence. Persons with a disability can win a cash prize of up to INR 2 lakh under this scholarship program. Students having 40 percent or more disabilities are eligible to apply for this scholarship. This scholarship is provided by the Social Justice & Special Assistance, Government of Maharashtra to encourage specially-abled students for pursuing higher education. The selected students receive financial assistance up to an amount of INR 1200. 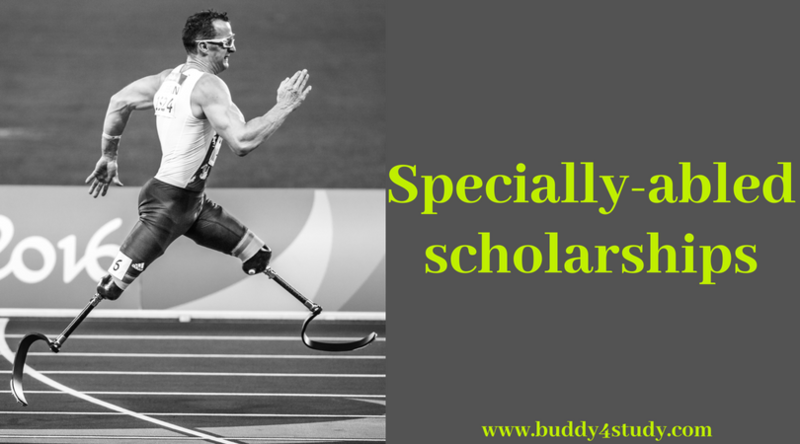 More details about these scholarships and other such scholarships can be easily found on the Buddy4Study website. All these physically challenged scholarships are in no way sufficient but they mark a step in the right direction. There is still a long way to go before physically disabled people receive equal treatment in the society. Our community as a whole needs to work on being more considerate. Equal rights, equal opportunities in education and employment, better infrastructure for the disabled and a general change in the attitude will go a long way in making our society more inclusive for disabled people.